In 2009 I decided to paint out main bathroom (as opposed to the master bathroom) – the walls were white, the toilet (obviously) and tub were white, the cabinet was an ugly dark brown and the hideous banjo-shaped counter was a groovy faux marble white/cream monstrosity. Much to my husband’s chagrin, I chose a very colorful butternut squash-y rich yellow-orange called Chamois, by Ralph Lauren. I love it. It is warm and cozy and wonderful for those mornings when you wake up feeling like hell and you need something more than a nasty white wall behind you as you look in the mirror. I also changed the curtain to something more neutral than baby elephants and bought a curtain rod in an oil-rubbed bronze finish to continue the rich, warm tones idea. In 2011, a more extensive update to the bathroom is going to be a necessity. The flooring was not well done and there is damage that needs to be repaired. Also, my children’s baths have caused further damage, I am sure, and although we were hoping to wait until they were over their lengthy baths, I don’t think that’s happening any time soon. So, flooring needs to be done, and also we can finally be rid of the nasty banjo counter and dark cabinet. The cabinet itself is in good shape, so I am thinking a good sanding and painting would do it a world of good. Thing is, I can’t make up my mind. Should I go for it and paint it white in order to lighten up the room? Or go the opposite way and go for a rich dark brown, not the nasty orange-y brown it is now. The medicine cabinet would be painted to match and the toilet lid would be changed. We do have a bit of time before I figure it out. 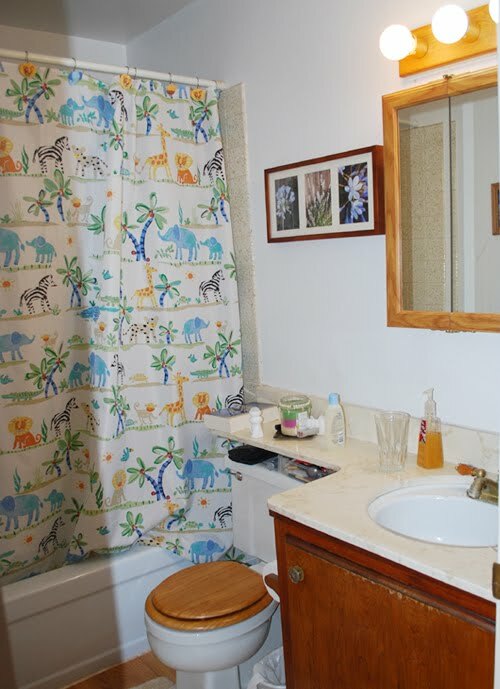 Right now we have a (ha ha) nature theme in our bathroom, with a framed Cavallini print on one wall, so I thought the aviary shower curtain would be a cute addition. If not, something very neutral, as I like to change the decor regularly. What do you think? Ideas? Suggestions? 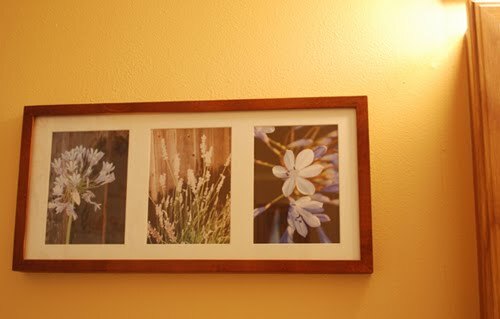 Are you keeping the lovely wall color? If so, I say, go for a dark cabinet, for sure! Oh definitely keeping the wall color – I'm leaning towards dark as well, thank you!